The Samsung Galaxy A9 (2018) is all set to hit the Indian market. The top-end Galaxy A smartphone will be launched in the country on Tuesday, November 20 at an event in Gurgaon. Samsung India is sending out media invites for the event which starts at 12 pm. The device will be sold exclusively by retailer Flipkart. Samsung unveiled the Galaxy A9 (2018) in Malaysia last month with the tagline “4X Fun”, highlighting it as the world’s first smartphone to sport four rear cameras. The phone was launched with a price tag of 599 euros (approx. ₹51,300). While there’s no word yet on Indian pricing, various reports suggest it to be a sub-₹40,000 phone. The Galaxy A9 comes to India a few months after the Galaxy A7 (2018), which is the company’s first phone with three rear cameras. The Galaxy A9, meanwhile, goes one notch up by sporting a quad-camera setup at the back. In addition to a 24MP main sensor with f/1.7 aperture, the smartphone also features an 8MP 120-degree ultra wide-angle camera with f/2.4 aperture, a 10MP telephoto lens with f/2.4 aperture for 2x optical zoom, and a 5MP depth sensor for Live Focus shots. At the front, the new A9 gets a 24MP camera with f/2.0 aperture. As for everything else, the A9 (2018) is powered by the Qualcomm Snapdragon 660 SoC. It comes with either 6GB or 8GB of RAM and 128GB of internal storage, expandable up to 512GB via a microSD card. The phone features a 6.3-inch Full HD+ (1080×2220 pixels) Super AMOLED Infinity Display with an 18.5:9 aspect ratio. The Galaxy A9 (2018) houses a 3,800mAh battery with fast charge support via USB Type-C. It gets a rear-mounted fingerprint sensor and supports facial recognition as well. The device comes with a 2.5D curved glass on the front and back sandwiching a metal frame. 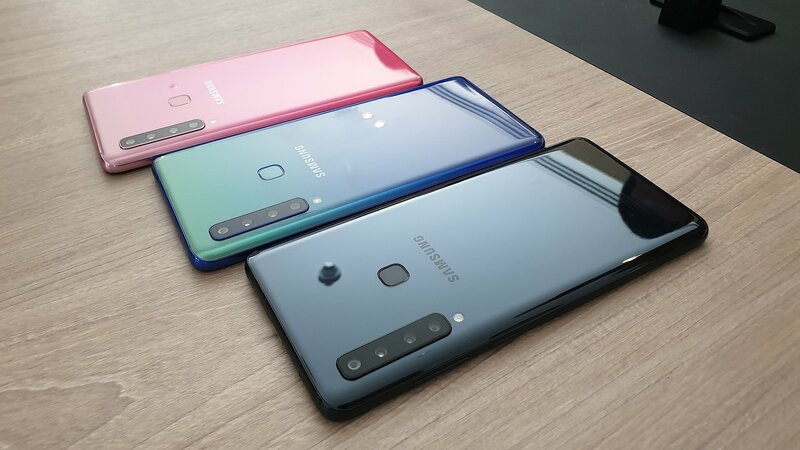 While the phone was announced in Bubble Pink, Lemonade Blue and Caviar Black last month, it remains to be seen if all three variants come to India. Want to know more about the Galaxy A9 (2018)? Read our hands-on experience here. “Sumit A. ” are you new writer ? Why did not you say hello? Hello Iocarno. Galaxy A9 (2018) was released in Malaysia last month. Where it was released before India ?